1600 Watt ASIC Miner Power Supply 200-240V 94% Efficiency Improve your ROI now. Includes 12 Port X-15 breakout board and 6 pin to 6 pin PCIE Cables. 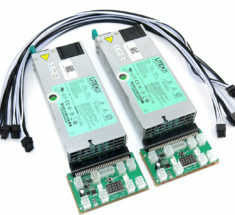 2000 Watt ASIC Miner Power Supply 200-240V 94% Efficiency Improve your ROI now. Includes 12 Port X-15 breakout board and 6 pin to 6 pin PCIE Cables. 2400 Watt ASIC Miner Power Supply 200-240V 94% Efficiency. Includes 16 Port X-adapter breakout board and 10 6 pin to 6 pin PCIE Cables. Great PSU. Using it on 240v with my S7’s. Easy to setup and they just work. Arrived exactly as expected to replace a failing APW3++ with an L3+. Has been working great for the last couple of weeks. No complaints. Will start using this PSU over the APW3++ wherever possible. Thanks for getting in touch with me seems the issue was due to Coinbase…Everything is up and running great now! Excellent PSU, quick delivery and very responsive customer service. Thank you for the fast shipment and quality used S7’s received. I am very pleased with your service. Do you have any idea when the next batch of Antminers will be available? 2400 Watt Power Supply Kit for GPU. Very nice, quiet and efficient. Great customer service & fast shipping. Flawless. These things ROCK!!! I have 4 of these PSU’s in series, running 8x 1080 Ti’s, 4x 1060’s (including risers), a Biostar TB250-BTC D+ MB, an Intel G3930 CPU, 8GB RAM, and an M.2 HD. Power on one, and all four come on. It just works. Antminer S7 ~4.73TH/s ~ The unit was shipped very fast and has been working great. The only thing I recommend is sending out updates on when the products are shipped. I had to contact the company to receive the tracking number. Other than that, I’m very impressed. Thanks! As always, exactly what I wanted, order shipped immediately and answers to questions were prompt.